These are essentially unwritten gym rules that should be posted to ensure the safest, cleanest and most productive environment possible. Seeing how the gym is a mini community, it’s important that those utilizing the community’s training environment do so in a way that is beneficial to everyone who participates. Let’s take a look at these gym faux pas that are funny on paper but annoying as hell in person. Here’s the situation: you slam out your last set on the leg press and have three caddies (45-pound weights) on each side. When you found the machine, it already had two caddies on each side so you thought, “Sweet! I’ll just add from here” not even thinking that it was pretty selfless of the person in front of you not to remove the weights. But instead of taking all the weights off when you are done, you think maybe someone else “as strong as me” will appreciate that you left them on. You know what, the 110-pound yoga girl wants to use the leg press too and doesn’t want to struggle to remove six 45-pound weights off the machine. Unwritten Rule: No matter how little weight is on the bar, kindly remove them so the next person doesn’t have to. Let’s say you get to the gym at around 5:30 pm, right after a busy day at work. As this is the only time you can get to the gym, you get to enjoy it with dozens of other people who also have to use the gym at “rush hour.” You want to do supersets and are either performing reps between two machines or have taken three sets of dumbbells for your 15-minute set. Unwritten Rule: In a crowded gym don’t hog the equipment. If you want to try to get in a huge set, see if you can get at least one other person to join you as to maximize the equipment. Just because no one wants to see you in your birthday suit doesn’t mean the locker is filled with homophobics. It’s just that it is completely unnecessary to walk around in the buff carrying on about your life story while every else is trying to get changed. Unwritten Rule: Only be naked as long as you have to. Note: this rule does not seem to apply to the Y. Most people accept that fact that people will bring in their phones to listen to music, look at emails or apps while in between sets, or order a smoothie with the Big Al’s app. Still, the last thing cell phones should be for in the gym is for people walking around, taking up space while on their phone who clearly want the attention. 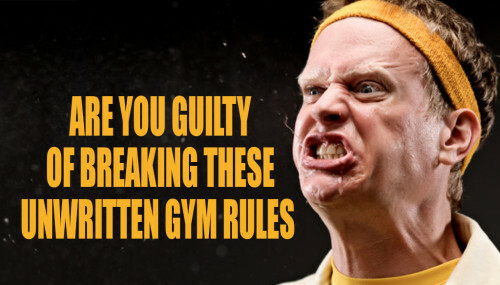 Unwritten Rule: You’re not that important; talk before or after the gym. Or just text dude. Unwritten Rule: Check your form in a mirror that doesn’t hinder anybody’s access to the weights. Ah, the refreshing water fountain. A place where we can get a quick rest in between sets and sip on some well-deserved cold water. That is until we get there and approach you, the guy with the half-empty gallon jug who has decided to fill it up in the water fountain and who doesn’t get out of the way for people who just want a five-second sip. Unwritten Rule: If you’re going to fill up your water jug at the water fountain, step aside when those without water jugs approach. At the gym there’s bound to be an assortment of different people with different body types. Big, strong, small and scrawny. Many of these people are new – just as you once were – and deserve the same respect as everyone else. Unwritten Rule: Be nice to the new guys; it creates a positive environment. This is an unwritten rule that probably shouldn’t even have to be mentioned but still gets ignored from time-to-time. Your head, your back, your rear-end – they all sweat. Give your gym friends a break from the knowledge that they have to share your sweat by wiping down after you use every machine or piece of equipment at the gym – even if you just got there and are not visibly sweaty yet. Unwritten Rule: Do we really have to say it?